Rice chemist Vicki Colvin led a team that created small, uniform spheres of cerium oxide and gave them a thin coating of fatty oleic acid to make them biocompatible. The researchers say their discovery has the potential to help treat traumatic brain injury, cardiac arrest and Alzheimer's patients and can guard against radiation-induced side effects suffered by cancer patients. Their nanoparticles also have potential to protect astronauts from long-term exposure to radiation in space and perhaps even slow the effects of aging, they reported. 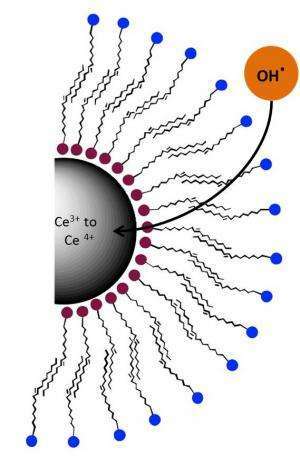 Cerium oxide nanocrystals have the ability to absorb and release oxygen ions—a chemical reaction known as reduction oxidation, or redox, for short. It's the same process that allows catalytic converters in cars to absorb and eliminate pollutants. The particles made at Rice are small enough to be injected into the bloodstream when organs need protection from oxidation, particularly after traumatic injuries, when damaging reactive oxygen species (ROS) increase dramatically. The cerium particles go to work immediately, absorbing ROS free radicals, and they continue to work over time as the particles revert to their initial state, a process that remains a mystery, she said. The oxygen species released in the process "won't be super reactive," she said. Colvin said cerium oxide, a form of the rare earth metal cerium, remains relatively stable as it cycles between cerium oxide III and IV. In the first state, the nanoparticles have gaps in their surface that absorb oxygen ions like a sponge. When cerium oxide III is mixed with free radicals, it catalyzes a reaction that effectively defangs the ROS by capturing oxygen atoms and turning into cerium oxide IV. She said cerium oxide IV particles slowly release their captured oxygen and revert to cerium oxide III, and can break down free radicals again and again. Colvin said the nanoparticles' tiny size makes them effective scavengers of oxygen. "The smaller the particles, the more surface area they have available to capture free radicals," Colvin said. "A gram of these nanoparticles can have the surface area of a football field, and that provides a lot of space to absorb oxygen." None of the cerium oxide particles made before Rice tackled the problem were stable enough to be used in biological settings, she said. "We created uniform particles whose surfaces are really well-defined, and we found a water-free production method to maximize the surface gaps available for oxygen scavenging." Colvin said it's relatively simple to add a polymer coating to the 3.8-nanometer spheres. The coating is thin enough to let oxygen pass through to the particle, but robust enough to protect it through many cycles of ROS absorption. In testing with hydrogen peroxide, a strong oxidizing agent, the researchers found their most effective cerium oxide III nanoparticles performed nine times better than a common antioxidant, Trolox, at first exposure, and held up well through 20 redox cycles. "The next logical step for us is to do some passive targeting," Colvin said. "For that, we plan to attach antibodies to the surface of the nanoparticles so they will be attracted to particular cell types, and we will evaluate these modified particles in more realistic biological settings." Colvin is most excited by the potential to help cancer patients undergoing radiation therapy. "Existing radioprotectants have to be given in incredibly high doses," she said. "They have their own side effects, and there are not a lot of great options." She said a self-renewing antioxidant that can stay in place to protect organs would have clear benefits over toxic radioprotectants that must be eliminated from the body before they damage good tissue. "Probably the neatest thing about this is that so much of nanomedicine has been about exploiting the magnetic and optical properties of nanomaterials, and we have great examples of that at Rice," Colvin said. "But the special properties of nanoparticles have rarely been leveraged in medical applications. "What I like about this work is that it opens a part of nanochemistry—namely catalysis—to the medical world. Cerium III and IV are electron shuttles that have broad applications if we can make the chemistry accessible in a biological setting. "And of all things, this humble material comes from a catalytic converter," she said.